No animal was injured or asked to do anything they didn't want to for the sake of our latest shoot for Epicurean Life. No model, either. 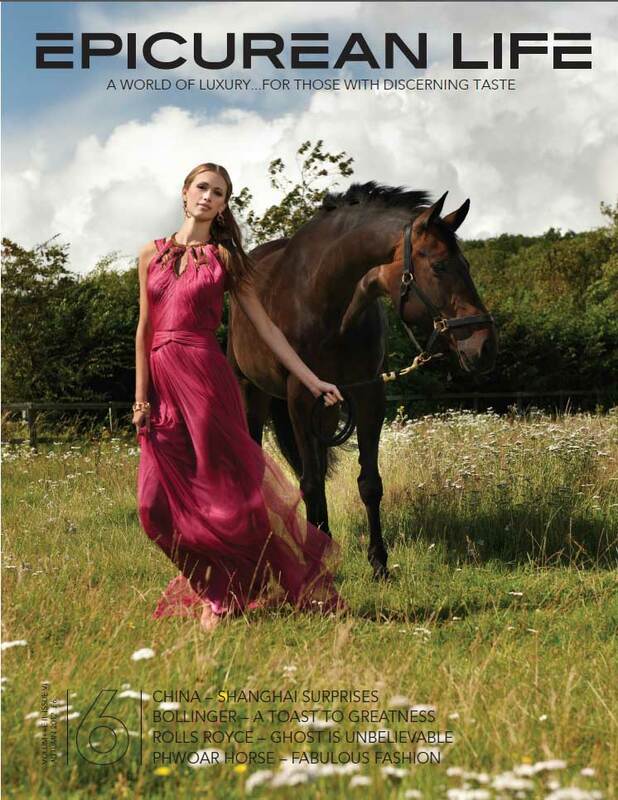 Happily horses, model - and designer dresses - all survived to create eight stunning pages and the cover. Health and safety? Pah. Our model, Kacy at Leni's Model Management, leapt onto the bare back of our 16.2 hand horse without a second's hesitation for our shoot, Phwoar Horse. All three dressage horses featured in our shoot belong to Georgie Somerset from West Sussex, who competes internationally - and has hopes for the next Olympics in Rio. Although highly strung, the horses were also highly disciplined and hardly gave a second snort at the camera - or lights. Bare-back halter necklines, tightly-harnessed waists and high-riding hemlines are all phwoar factors for the top designer looks that are perfect for the new season’s social eventing. And, even more perfect, is the pairing of the age of dramatic dresses with these stunning British dressage horses, paying homage to our equestrians, winning golds at the Olympics. Truly a Dress-age. So I rounded up the well-groomed gowns, the glossiest accessories, shiniest jewels and my little ponies. Dressing up in party frocks and playing with real life Rainbow Dash, Twilight Splash and Princess Celestia. What more could a girl want? Hair and make-up was by Gill East (she drew the line at grooming the horses' manes). Photos by Darren Paul. Dresses were Catherine Deane (cover), Jovani at Hollie de Keyser (left); Halston Heritage (above right); Koo-Ture, Herve Leger and Ted Baker (below left to right).